This is the 20th novel by this very experienced author and follows on from her non-fiction book, OUT OF HARM'S WAY, from last year which draws on her experiences as an evacuee during the Second World War. It is 1940 and following the defeat of the British Expeditionary Force at Dunkirk a lot of the British public are fearful of the immediate future, and want to evacuate their children to safer countries in the Commonwealth and the USA. Two Cornish boys, named Ted Johns and Jonathan Hicks, both of similar ages but different backgrounds, one from a poor working-class family, one the son of wealthy middle-class parents, are sent to Liverpool to board a ship to evacuate them to the USA. The ship that they board sets sail, in a convoy, across the Atlantic but unfortunately is torpedoed and sunk by a German U Boat. The two boys happen to share the same raft but one of them dies and the other lives. The one that survives uses the only available identity papers to convince the American relations that he is theirs. After the war in 1951, the grown up boy survivor returns to Cornwall to claim his inheritance, his parents having died. He is an artist and soon he becomes very well known. However, people start dying and the narrative takes on a completely new journey. This is a very different novel as it is set in three different periods the 1940s, the 50s and the current day. The author even includes herself in the story-line as she goes about researching and writing her non-fiction book OUT OF HARM'S WAY. It is a very intense story, extremely realistic, that keeps you riveted all the way through until the tension is ultimately released in a spectacular finale. 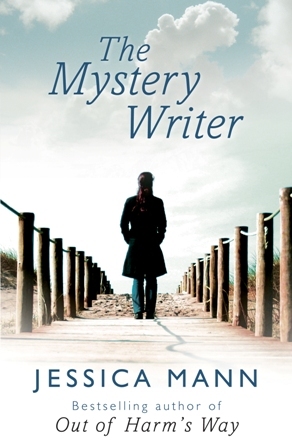 Read another review of THE MYSTERY WRITER.